The user manual for my Mophie portable power pack proclaims its undying love for me. Like a lot of people, I first met you after December’s ice storm. I suddenly found myself with things to charge and few places to charge them. The backup battery for my phone was great for my phone, but not for anything else. And it only gave me one charge, not nearly enough for three days without power. We took refuge at my mother-in-law’s, who had more than enough power to go around, but the ordeal made me realize just how vulnerable I am to power outages. I felt mortal. Weak. A poor provider. So once cats, wife, and laptop were safely provisioned in a warm house, I set out to find comfort in a portable power pack. I found you in Future Shop, looking lonely on the rack and offering up promises of exactly the kind of portable power storage I needed. I gave you a quick once over. With two quick-charge USB ports, you’d be fast off the mark and reach the finish line without a lot of waiting. I asked the guy at the counter about you and he said we’d be perfect together. He gave me a knowing wink and added that you’d be able to charge me three or four times before I’d have to charge you even once. I nodded silently, thinking, Huh, that sounds pretty good. You were stylish, if a little chunky. A little more than I was hoping to spend for a quick charge, but hey, any USB port in an ice storm. After some quick pleasantries, I paid your tab at the cashier and took you home. I thought we had an understanding that this was just an arrangement of convenience; no pressure, and only the barest thought given to long-term compatibility. So I was a little surprised when I started unboxing you at home only to have you declare your love for me almost immediately. 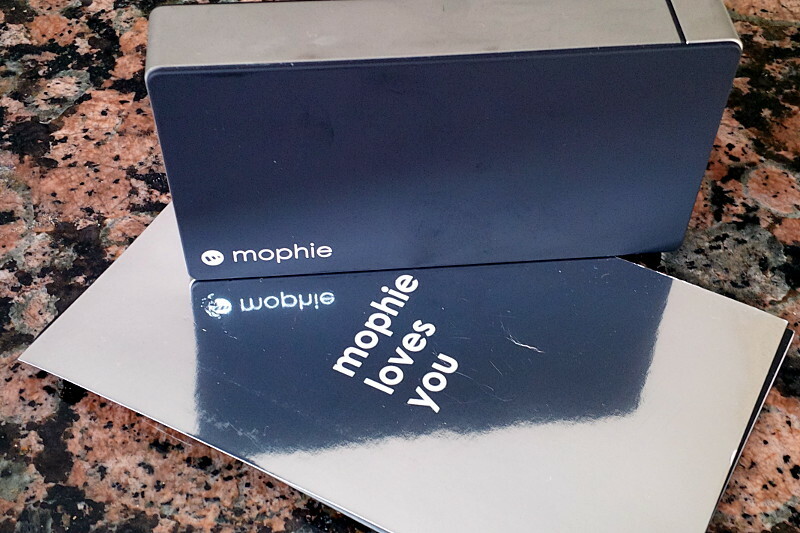 “Mophie loves you,” you said, channelling George Costanza in the third person. “Let’s just see how this goes for a little while first,” I said. You blinked a couple of LEDs at me as I plugged you in, and everything seemed fine. We’ve had a few charges in the weeks since then and the guy at the counter was right: I can charge you once and then just sit back while you charge me over and over again. It’s given me some measure of comfort knowing that when the darkness comes again, I’ll be able to wrap your cables around my phone and keep the LTE lit up for a few days. But your words linger in the back of my mind. Mophie loves you. I threw out your clamshell a long time ago, knowing that I wouldn’t need to kick you out, and you go with me virtually everywhere now, providing silent support should I ever need it. But I still have your receipt on top of the pile. I’m obviously not completely comfortable with the way things are. It’s not that I don’t like you, but…”Mophie loves you.” That’s tough to swallow right off the bat, and it’s just kind of been hanging out there since our first encounter. You haven’t pushed it, but it’s a definite undercurrent in our relationship. And with Valentine’s Day behind us, it’s about time that I address it. Mophie, I don’t love you. Don’t get me wrong, I like you and all, but I just don’t see us having a long-term future. Sure, 500 charges sounds like a lot, but realistically, that’s only a couple of years before you start getting old and don’t charge me up the way you used to. And other than charging, we don’t really have a lot in common. By this time next year, I’ll be eyeing some fresh new power packs that will weigh half as much, deliver just as much of juice on demand, and won’t be nearly as clingy. I mean, let’s face it: the only reason I picked you is because you were the only one left on the shelf, the joint was getting ready to close, and I was kind of desperate. There may have been a reason you were the last one sitting around that day. Everyone you’d arrived with had already partnered up and left; why were you still hanging around? I don’t think I’ll ever really know, but I’ll always have my doubts. Anyway, I wasn’t in the best frame of mind when we met and certainly had no intention of committing to anything long term. I do appreciate the support you’ve given me so far but let’s park the “Mophie loves you” talk for now. I’m happy to keep using you for the occasional power trip. In return I’ll keep you charged up as much as possible and take you with me whenever I go somewhere. Let’s just be friends, with power benefits.